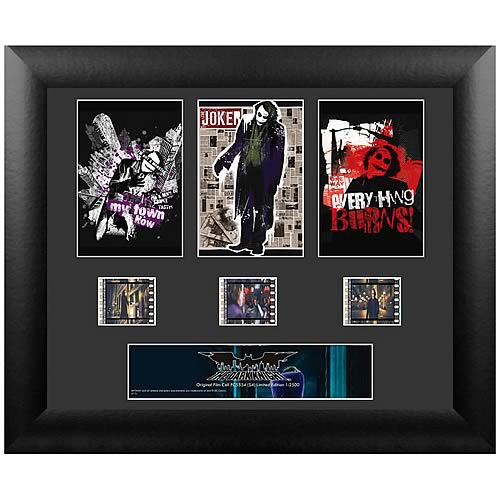 This amazing standard triple film cell features prints and actual strips of film from the film The Dark Knight. It measures 13-inches wide x 11-inches tall. Perfect for displaying in your home or at the office, all the elements are framed in black wood and include a certificate of authenticity. Order yours today! Limited edition of 2,500 pieces. Please note that the actual cells of film vary from piece to piece as they are hand selected from reels of film. Gotham City is under siege once again and it's time for Bruce Wayne (Christian Bale) to put on his Bat-costume and do battle with two evil enemies: the Joker (Heath Ledger) and district-attorney-turned-villain Two-Face (Aaron Eckhart).